Aw yeah man! I've been a fan of Art Baltazar & Franco's Tiny Titans comic since it started and it's sad that it's ending at issue #50. I would've been making Tiny Titans sprites long ago if I thought my scratch-made spriting skills were good enough to do justice to that drawing style. 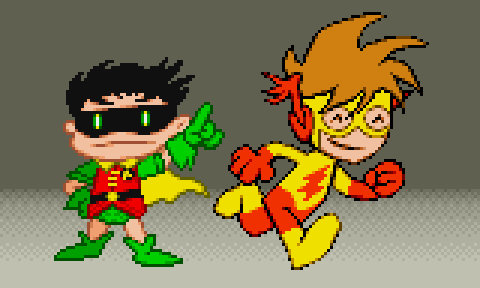 Robin (sprited in 2012) and Kid Flash (2015, during Flash Week) are based on their poses from the cover of the first issue.